Posted on 07.15.11 by admin. 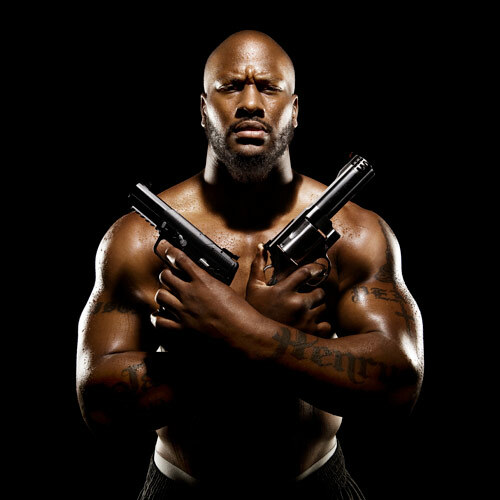 James Harrison‘s scathing interview for the Men’s Journal got him in to some hot water for several reasons. Harrison used a gay slur towards NFL Commissioner Roger Goodell then criticized his teammates, QB Ben Roethlisberger and RB Rashard Mendenhall. But the NRA felt it necessary to disapprove of Harrison’s brandishing guns inappropriately. So leave it to Jeff to show James how it’s done! Jeff vs James? You decide. 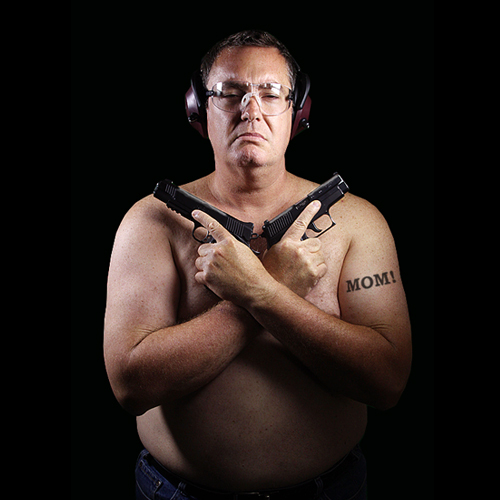 Fingers off the triggers, eye protection securely in place, and hearing protection. That’s how it’s done! Just as well there is a caption below, or I wouldn’t know the difference between the two. Nice tattoo. The exclamation point makes it. I like james he flyies in the face of what is acceptable which makes him my hero. MOM! haha I love it! the face is exactly the same! Steven was posing me while looking at the photo. Was very fun to do. that is too awesome for words, Jeff!!! Love it!!! you and Steven always give my spirits a lift and a giggle…keep it up!!!! My mom was more thrilled than anyone with the tat. Might need to get a real one just to keep her happy! Ha ha ha Awsome pic, a true coffee on keyboard moment in the office! Oh god, I love it, but how ’bout a little warning next time? Only just seen this. OH Jeez that is so funny. Am I the only one that’s bothered by the fact that these guys haven’t got belly buttons?